This is Scorpio-Sagittarius cusp week: Scorpio passes the baton to Sagittarius on Monday, 21 November. As a mutable Fire sign, Sagittarius is free-spirited, jovial and outspoken. Sagittarius energies will lift our spirits and promote a more philosophical approach to life. Careful with the philosophising, though: on Thursday, 24 November, light-hearted and expansive Jupiter (which rules Sagittarius) squares dark, intense Pluto (which rules Scorpio, incidentally). 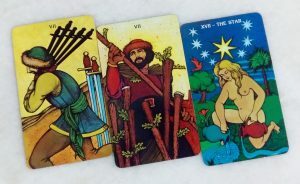 So be careful of what you say, and how you say it, because misunderstandings are likely to arise – cusps can be tricky like that, but no worries, it’s just the energies shifting. Stay calm, everyone: at work, keep your head down and your eye on the ball; in personal relationships and situations, stay upbeat and positive (in other words, do a Sagittarius!). LEFT: SEVEN OF SWORDS. Some call this The Thief’s card; others call it The Lone Wolf. When this card appears, what you see is not what you get, and trust issues may come into play. Have people, incidents and events in recent times shaken your faith in humanity and left you feeling robbed of what you deserve? Or perhaps you’re involved in something which, if it ever saw the light of day, would damage what you hold dear and leave you vulnerable. You might be feeling helpless and lonely in a difficult situation, at work or elsewhere. Dear one, Spirit and the Universe are for you – not against you. You are not alone. In that case, what can be done to alleviate the burden of the Seven Swords? MIDDLE: SEVEN OF RODS. This Week’s Tarot suggests the Seven of Rods to balance out the energies of the Seven Swords. This is the card of self-assertion, and the key to self-assertion is being honest with yourself (rather than wilfully deceiving self and others, as the Seven of Swords sometimes suggests). Knowing who you are and what you stand for will be crucial when you make the choice to assert your political opinion, your racial/cultural/gender identity, your fashion choices… whatever! RIGHT: THE STAR. This is a lovely card to round out This Week’s Tarot. When The Star appears, the light is appearing at the end of the tunnel. Hope springs eternal, dear one; even if you’re feeling like things right now are not going well for yourself (or the world around you), there is cause for optimism. The Star gives us the encouragement we need to stay focused and true to ourselves. Things will get better; it won’t be easy, and action must be taken for our individual and collective destinies to be shaped the way we want them to be, but they will get better. Hang in there, and do what’s right. Walking in the Light: it starts with being real.